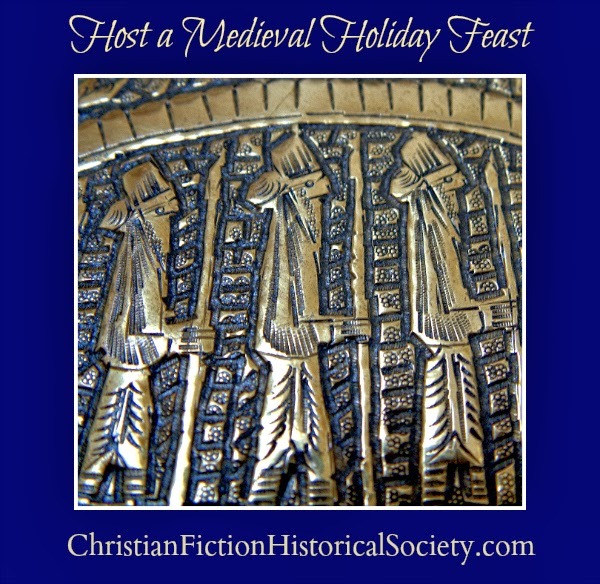 For a fun spin on Thanksgiving or Christmas, why not host a medieval feast? It’s easier than you may think, although the philosophy menus were based on in the Middle Ages seems a little strange to us today. Physicians advised medieval cooks to balance the four humors in the foods they served to keep diners properly balanced. For example moist foods served cold (like some meats) aligned to the property of Phlegm and as a counter-measure called for sauces or spices that were hot and dry. Foods that were on the dry side were boiled, never roasted. Moist foods were baked to dry them. That sounds like a lot to keep track of, but surprisingly, medieval feasts were not all that different from those of today. That’s because modern eating habits have their roots in history. A medieval feast often started with a soup, salad, light fruits, or light meats. Foods more difficult to digest like beef, pork, and heavier fruits and vegetables followed. The meal wound down with something sweet. As today, special occasions called for elaborate desserts. Cheese was taken as a digestive aid prior to the meal and after consuming meats. Similarly, fish was followed by nuts. Medieval cooks were not afraid of spices, since they also were thought to aid digestion. A medieval feast was served in courses, with each course composed of several offerings. There might be many courses of a few items each or only a few courses made up of many dishes. Diners ended the evening with wine and sweet fruits and cakes. Royal feasts featured lavish spectacles called solteties, elaborate creations crafted mostly from sugar in the likeness of warriors, heroes, mythical tableaus, or whatever other shape might be desired. Another medieval amusement was to disguise one food as another. A cake might appear as a realistic-looking fish, for example. Investigate medieval recipes at GodeCookery.com. Medieval diners drank a variety of wine and ale throughout the meal, but if you prefer, you can substitute apple cider, grape juice, and water flavored with lemon or mint. To replicate a medieval dining experience, take time to talk, listen to music, or enjoy a holiday presentation between courses. Your feast should span several hours. Give guests a final sweet snack and drink at the end of the evening. The post is brought to you by Janalyn Voigt. Escape into creative worlds of fiction. When Janalyn was a child, her father read classic literature to her at bedtime, instilling in her a love of story. With a teacher's encouragement, she decided to become a writer at the tender age of twelve. Beginning with DawnSinger, Janalyn's medieval epic fantasy series, Tales of Faeraven, carries the reader into a land only imagined in dreams. Janalyn is also working on a romantic suspense novel set in a castle. She is represented by Sarah Joy Freese of Wordserve Literary. When Janalyn is not writing, she loves to find adventures in the great outdoors. 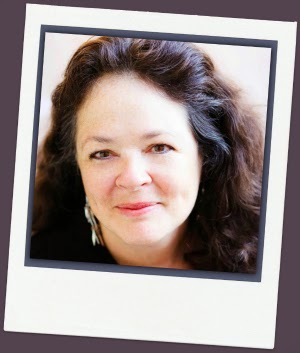 Janalyn posts interesting details from her research, travel journals, author journals, and updates about her books at her Creative Worlds website. I have not read your books but they sound so interesting love the name Faeraven also, is this made up or is there one out there...thanks for sharing today. Hi, Paula.Thanks for your comment. I'm going to use this information to create at least one holiday feast, myself. Jackie, we must think alike because I find that fascinating, too. I've attended two Madrigal dinners, and they were very enjoyable events. I can't imagine cooking up such a feast without the aid of modern appliances. I imagine they were set up for convenience in some ways, but that's an interesting point, Vickie. As part of a medieval reenactment group I've attended feasts, and that last parting gift of food is really special. Fascinating post, Janalyn! I had no idea Medieval menus were based on the four humors. 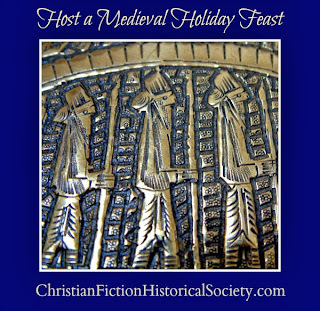 I could totally do a Medieval Thanksgiving and Christmas! Now if I could just get the outfit. . . :) Thanks for sharing this! You're welcome, Britney. It seemed a timely topic for November. Oops. Yes you're right about that Pegg. They were thought to be poisonous. Yum. Looks like an ad from my favorite whole foods market. The Medieval dietary philosophy sounds much like one we'd find promoted today. I'd never thought about this much before. Very interesting. Thanks for sharing! You're welcome. Julia. I love to experience history through cooking, and I'm glad to share what I discover.